Purr Scouts Valentines' Design Project! Hello! We are Purr Scouts Leaders Sensi and Ivy with our hubkitties and fellow Purr Scouts, Simon and Pepper Poisson! We are happy to tell you about the Purr Scouts latest project; we are going to have our furry own Purr Scouts Valentines, thanks to our own Offical Purr Scouts Webmaster -- Bandicoot! 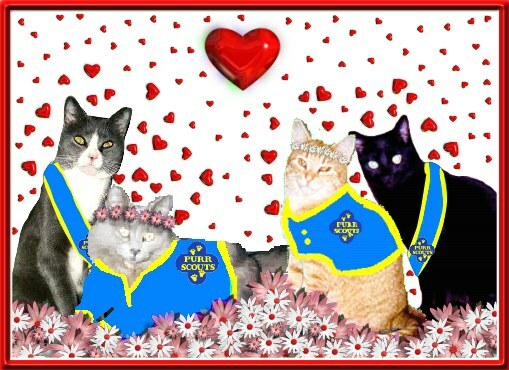 And YOU can join in the fun AND earn the Purr Scouts Valentine Designer badge! 1. 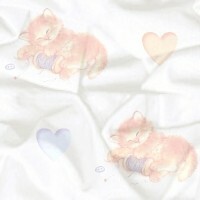 Create an original card design suitable fur a Valentine's Day card. Purr Scouts may submit only one design per Purr Scout. 2. Design size MUST be no larger than WIDTH = 250 HEIGHT = 350 (or vice versa). 3. Designs must be sent in "jpg" or "gif" file format. 4. Designs must be received NO LATER THAN February 12th! There's not much time Purr Scouts, so let's get busy and get those Purr Scouts Valentines' Cards ready fur the whole world to admire and send!